Most people know Dubai as a high-tech, high-cost metropolis (and perhaps the ultimate rags-to-riches story ). So, the desert city might not be the first place your mind goes when you think of a romantic getaway. You might opt to go to more glamorous areas, like the old cities of western Europe, the ancient pagodas of Japan, or the crystal blue waters of the Mediterranean. But don’t count Dubai out. A lot of people think it’s just a playground for millionaires, but nothing could be further from the truth. Not only is the city affordable (with the proper planning, it’s far less expensive than a place like New York), it’s also a stunning swirl of sights, sounds, and experiences…that are all perfect for couples. Imagine spending a night under the desert sky with the love of your life, experiencing the endless sands as it was hundreds of years ago. Or, picture yourself lounging on the white sand beaches with your soulmate, framed by the aquamarine waters of the Persian Gulf. Dubai offers an unexpected, surprisingly inexpensive anecdote to the tourist-choked, well-traveled honeymoon destinations. As we’ve mentioned before, Dubai is a major international hub. In terms of international travelers, the airport is a heavyweight–clocking in at nearly 83.6 million people annually. That’s the largest in the world by volume (and with good reason). It’s so easy to get to Dubai. Emirates Airlines (also known as the world’s best airline) flies from 141 cities across the world. Even if you’re on your way to somewhere else, it’s in your best interest to spend a few romantic days here. In many ways, Dubai is a preview of the future. Make your way to the sprawling, beautiful (and wholly manmade) Palm Jumeirah. This island is a stunning achievement of engineering and a scenic location for couples seeking a secluded escape. Where else can you sit on a manmade island, surrounded by countless miles of white sand beaches and the serene Persian Gulf, and populated by world-class resorts like Atlantis, the Palm or the Fairmont Palm? Couples can sit down to beachside dinners and open-air restaurants perched on the shores of the Persian Gulf, pamper themselves with a stay at the spa, or retire to stunning luxury villas with turquoise plunge pools overlooking stunning coastal vistas. Browse the vibrant, beating heart of old Dubai with your special someone. The souks, or traditional Arab markets, are a mix of sound, color, spice, and energy. It’s like stepping into the past, when Dubai was just a small fishing port on the edge of the Middle East. Once upon a time, Dubai was known for pearls. Today, the city’s best-known luxury product is gold–peddled in the gold souks in Deira, Dubai’s old town. Glittering bangles, necklaces, earrings, and even intimate wear are all crafted from gold, some even adorned with precious and semi-precious stones. Or browse Dubai’s other famous products: spices and textiles. The Middle East once brought the finest silks in from China and the Far East through the Silk Road. Today, silk is still traded, especially in the form of keffiyehs, headcloths native to the region, as well as fine, silky-soft pashmina and cashmere. Because scent is the sense best tied to memory, the spice market is a perfect place to end the day with your partner in crime. Browse the spices on display, from mounds of cinnamon (once thought to have been stolen from the nests of giant birds by daring souls) to saffron (the richly-colored spice quite literally worth its weight in gold). It’s a (memorable) assault on the senses and an authentic Dubai experience. 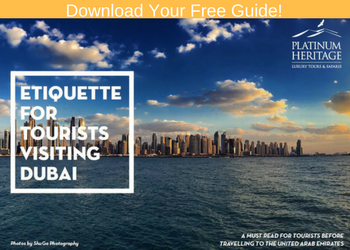 But don’t just stay inside your hotel–or even within Dubai’s city limits. For a luxurious desert escape, try our Platinum Desert Safari. Begin your excursion to your Royal Desert Retreat inside brand new, luxurious Range Rovers. 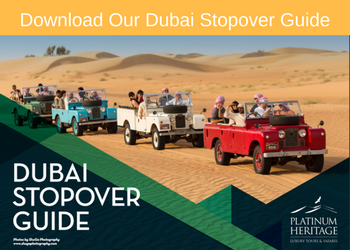 From there, you can explore the nearby wildlife reserves, hoping to catch a glimpse of the rare Arabian oryx (or the lovable sand fox). Watch the sunset over the desert hills with sunset canapes (consisting of offerings like white truffle infused custard and tea smoked lamb) and observe an exclusive falconry demonstration. Afterwards, take shelter alongside a desert oasis, far from any trace of civilization. Here, you can ride camels, smoke shisha, and watch the private belly dance performance. For dinner, enjoy a 6-course gourmet feast atop an antique Arabic wooden door in your serene royal getaway. Relax in the comfort of silk carpets, fluffy cushions, and your own private Majlis. Alternatively, you can opt for a more rustic, authentic adventure with our Heritage Desert Safari. Ride in museum quality 1950’s Land Rovers to a recreated Bedouin tent (as the nomads lived so many years ago). Experience spectacular falconry demonstrations, ride camels through the desert, and feast on local delicacies. If you want, you can even partake of the overnight safari. Here, you can watch cultural performances, smoke shisha, and enjoy a 4-course meal. Then, spend the night in your rustic, secluded escape, a Bedouin tent under the stars. In the morning, you’ll wake up early and be driven to your hot-air balloon ride. Prepping for sunrise, you’ll watch as the crews fill these giant balloons with great bursts of fire. Then, step aboard and leave the desert dunes to float gracefully through the air. Alongside your partner, watch as the sun rises across the desert sands, golden rays of light peeking out tentatively from a pink, lightening sky. To make it all the more special, watch as a trained falcon flies around the balloon in beautiful orbit (the only place in the world you can see this). Dubai is not simply an economic powerhouse; it’s also a city steeped in culture and custom, a land where past, present, and cutting-edge future collide in a whirling kaleidoscope. Steeped in history, luxury, and the promise of bright tomorrows to come, there is no better place for a romantic getaway than Dubai.